Though your average fan would normally not expect it, Australia's metal scene is rather powerful. Home to such cutting edge bands as Portal, Mournful Congregation, Ne Obliviscaris and countless others, the late 2000s have shown this distant nation pulling its own weight. My earliest experience with Australian metal happened to be with a lesser-known death/doom band by the name of InSomnius Dei, whose album Illusions of Silence I spent the better part of a year trying to find. I sort of forgot InSomnius Dei after five years of silence, but, while browsing the Doom Forever Forever Doomed forums, I came across former vocalist Terry Vainoras's newest project, Subterranean Disposition. After speaking with him, he wasn't really ready to share the entire album with the press just yet, but I was given the opportunity to review the mammoth "The Most Subtle of Storms," which he had made public. Mind all of you, I've never done a single track review, so this should make for an interesting read, eh? 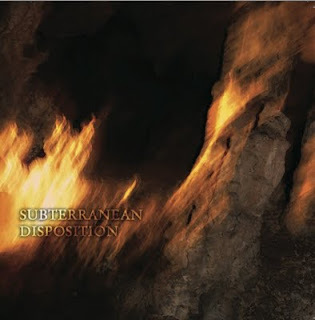 Much like his previous projects, Subterranean Disposition is a death/doom metal band with some ambient influences thrown in here and there, leaning more towards the crawling, funereal side of things. "The Most Subtle of Storms" has it all: crushing riffs, deep growls, ethereal harmonies, unadulterated emotion; all the things I look for in a more melodic death/doom project. Of course, there are little nuances here and there that really do set Subterranean Disposition apart from the others. Around 6:45 into the 14 and a half minute epic, Vainoras includes a rather new-age-sounding saxophone track. Not a jazzy saxophone like you might hear in a Ved Buens Ende or Sigh song, but something much more melodic and calming, acting as a much more unexpected textural companion to the quiet guitars. Unfortunately, there are some elements here and there that I don't super enjoy, but can definitely stomach. The "robot" voice strewn throughout the song can get a little tedious, but I suppose it's better than having some obnoxious, overzealous soprano half-vomit all over the otherwise pretty awesome song like many death/doom bands have done in the past. It's not terrible, but the hollow digital echo can get obnoxious as the track plods along. Also, from around 10:45 to 13:30 there is nothing but samples of waves crashing against a shore. I'm sure in the grand scheme of the album it makes sense, but when you can only listen to one track the idea of spending three minutes listening to ocean samples can get a little annoying. At least the samples let up and leave the final minute to contemplative, more atmospheric clean guitars that slowly fade into nothing. Overall, despite its faults, I did enjoy listening to "The Most Subtle of Storms" very much. It presents a very strong case as to why I will have to get Subterranean Disposition's self-titled debut whenever it might come out either later this year or early on in 2012. As a bonus, you can stream the track right here!